Please contribute by continuing to ask questions and respond to posts in the Indy (Pro-Ride Chassis) - HCS Snowmobile Forums thread. If there is inaccurate information, please post below or send me a PM and advise what is incorrect. If you see topics that need to be added, post or PM. Resource Guide - Acronyms, Weights & Measures, Conversions, etc. Last edited by servocam; 09-03-2018 at 04:17 PM. VOYAGEUR is now its own line and Axys chassis. 2017 800 Indy SP: R.I.P. Resource Guide - Acronyms, Conversions, etc. TOTAL = ~90 lbs fluids + ~449 Sled = ~539 lbs. Last edited by servocam; 09-05-2016 at 08:50 PM. 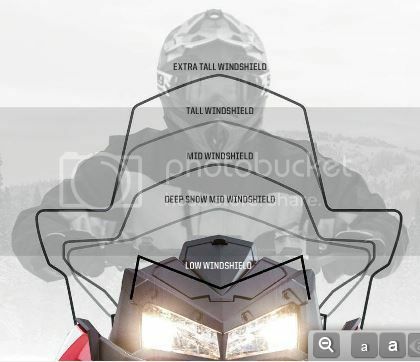 Note: You cannot have both Mirrors and hand-guards (unless really tall). You can go to Polaris.com and "Build" the sled to see what some different styles look like. Last edited by servocam; 12-13-2016 at 07:29 AM. The only place you can get 12VDC power is on the 2-pin SAE quick disconnect connector, which can be found under the hood between the headlights.. You can purchase the mating connector at any auto parts store and others (Fleet Farm, Walmart, etc.) for ~$3. Last edited by servocam; 12-13-2016 at 07:10 AM. First tank with oil added to it (RTFM!). Vary the throttle / Do not cruise at a constant 30mph for the first tank! Don't be afraid to get on it hard for a few seconds at a time. Roller-Coaster the throttle. 125 psi for 600/800. Results may vary from tester to tester. Cylinders should read the same. - use a compression tester designed for small engines! - be sure key is off and kill switch engaged. - Simply drive in loose snow and get on the throttle to kick up some snow! - If you are hitting >150 degrees, then check your coolant system. Burp the system and you may need to check the thermostat. Most likely have air in the system or the thermostat is installed incorrectly (it needs to be orientated correctly). PM northstarrick for details or look up NORTHSTAR PERFORMANCE N.H. On FACEBOOK. This kit can drop your temps as much as 25 degrees. Please keep it quite. 2nd biggest complaint from people is dumbasses that keep BRAP BRAAAPing their loud pipes. (#1 is going off the trails). Keep that Sh!t for your private property & drag strip, and OFF the State/Grant-in-aid trails please. RTFM! It's all in there! Do NOT run Ethanol if you can avoid it! If you can afford a snowmobile, you can afford to purchase premium fuel. Whenever using ethanol, MTBE or other forms of oxygenated gasolines, the fuel type designation setting must be changed to “ETH” in the gauge. When using the recommended 91 non-ethanol gasoline, always select the “91-NON” setting. It is safe and recommended to use Isopropyl with Non-Eth fuel - RTFM! We don't exactly know how much power the 600 and 800 have. The 600 is somewhere between 110hp - 125hp and may vary from year-2-year and if you modified the pipe. The 800 is somewhere between 140hp - 150 hp. Google search resulted in some data to make a 600 Chart and 800 Chart. VES oil or other IMO, just keep it simple and use the Polaris Engineered VES Synthetic 2-cycle Engine Oil (1 Gallon) - Item #2881017. If you plan to use a different oil, you may need to remove the tank and clean it as not all oils will mix with each other safely. has and how it has damaged engines. Short story - it is cheap to add a vent vs.
PM northstarrick for details or look up NORTHSTAR PERFORMANCE N.H. On FACEBOOK. Last edited by servocam; 12-13-2016 at 08:13 AM. Only one place to go - contact/PM Gabes for his kit. The biggest complaint is the OEM track that comes on the 600 Indy. - required if you stud your track. Rail Extensions with hardware to install (No Tunnel Extension needed). Rail Extensions and Tunnel Extension with hardware to install. Last edited by servocam; 12-13-2016 at 07:34 AM. Shock Length (C-C) = 17 3/8"
Last edited by servocam; 09-05-2016 at 08:58 PM. Drill out from bottom side up. Purchase dimple-die set. Last edited by servocam; 12-15-2015 at 07:34 PM. The boat is in storage, you just got done watching the grass drags and decide to go picked up your sleds from storage...now what? More to come / check list. Awww maaaaan...the season is over, no snow left to be found. What are the necessary steps to get my sled(s) ready for storage? Great thread by ZEG that is WAY better than the Extended Storage section when you RTFM (pg ~107). Last edited by servocam; 04-04-2015 at 11:20 PM.